A study just released by United We Dream and others last month shows that DACA recipients experience both economic benefits and uncertainty. Ninety-six percent of DREAMers are enrolled in school or employed, 78% have experienced an increase in their wages, but over 50% are worried about themselves or a family member being deported, and over 70% worry about not seeing their children grow up. This comes as no surprise as Congress has transformed DACA into a political football in the last year. Lower courts, even as recently as last week, have consistently reaffirmed the constitutionality of DACA, which has allowed current DACA recipients to remain in the country and renew their status. However, our federal government continues to abdicate its leadership and keep DREAmers under constant threat of losing their status. Congress refuses to pass legislation to codify the program into law and provide DREAMers a path to citizenship, which over 80% of Americans support. As a result, nearly 25,000 DREAMers have already lost their status making them targets for deportation by this administration. DREAMers from all communities are unified in refusing to trade their status for legislation that would escalate immigration enforcement, family separation, and deportation. 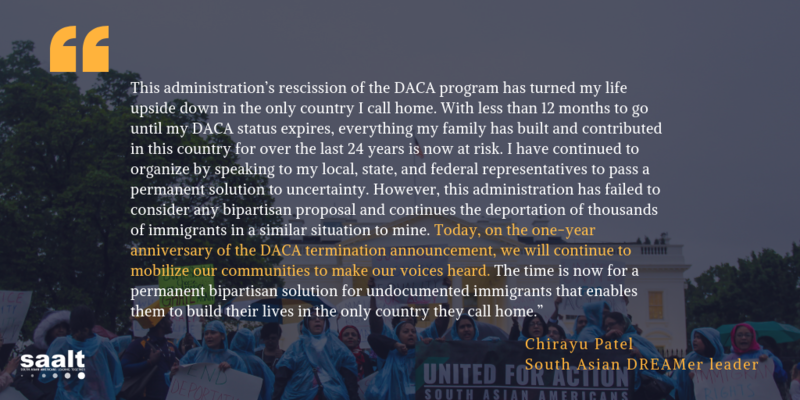 South Asian American DREAMer leaders, including Chirayu Patel and Ruchir– both of whom have built their lives here, and know no other home but the United States—have stood strong and rejected this devastating bargain.